We all have those days. Those days where you drank a little bit too much the night before, or perhaps one too many pieces of pizza. Maybe you were out with friends celebrating a special event, or maybe you were just enjoying a relaxing night in by yourself and decided to treat yourself. We all overindulge at times, it is part of being human. Although I don't really like the term "over indulge" maybe your body is just craving something a little lighter today. Part of intuitive eating is being in-sync with what your body's needs, and giving your body what it asks for. We nourish our bodies every day with from the inside out by how we feed it, how we move it, how we treat it, and who we surround ourselves with. Food is our greatest medicine, and every day, at every mealtime, we are given the unique opportunity to feed it with whole foods, eaten as close to the picking time as possible, and hopefully, from a sustainable source! Avocado, cucumber, ginger and fresh green apple grace this smoothie bowl's base, with hints of coconut water and fresh green kale balancing out the entire bowl. I topped my body with my favorite toppings such as nut-free granola and an array of fresh seeds from my local health food store's bulk bin. That big pretty flower you see is Nasturtium flower, which grows wild here in Los Angeles. I have a plant in my backyard so I'm very lucky! Eating more edible flowers is something you should definitely do. They are full of vitamin C, and help those who have seasonal allergies. Eat more edible flowers always. Learn more about the benefits of eating them by going here! With no frozen fruit or vegetables, this smoothie is also served room temperature so it's even easier for your body to digest! Talk about pros, man. 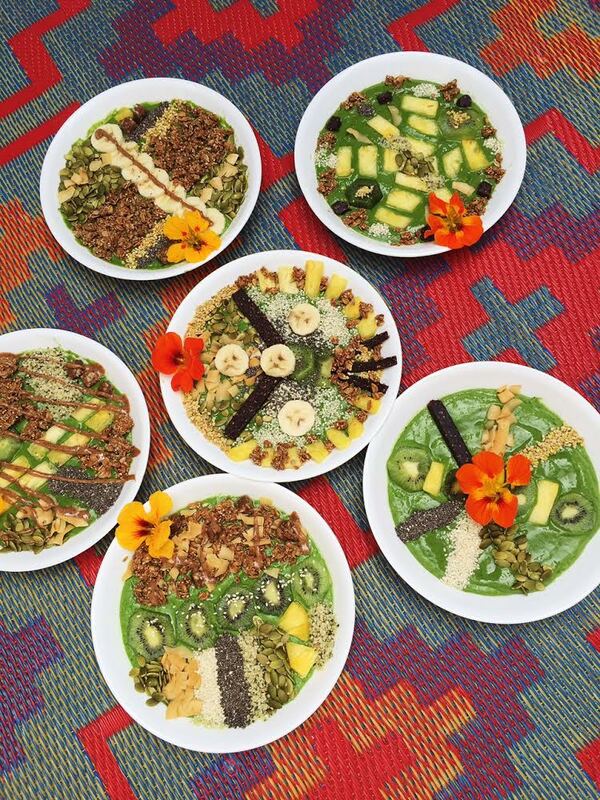 This smoothie bowl was designed with your body in mind. Low-glycemic, refreshing, and rejuvenating, this smoothie bowl is just what your body is asking for after a long night of too many martinis or too little sleep. My boyfriend makes a pretty beautiful bowl. Place the cucumber, green apple, kale, avocado, coconut water, and ginger into a blender. Blend for 3 minutes or until smooth. Make sure you blend well- no chunks allowed! Top with your favorite seeds, granola, and almond butter. go crazy!